When analyzing regular season baseball, we tend to look at the big picture. Anything can happen in a single game, so examination with a larger lens will help us better understand what’s going on. But in the playoffs that all changes. Bench players stay right there, as teams roll out their A lineups every day. 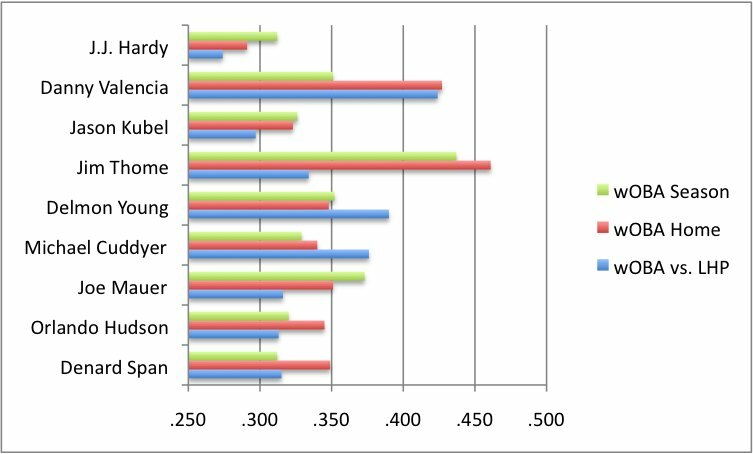 Injured players, who influenced the team’s overall season stats, play no part in a postseason run. There’s also no chance of missing an opposing team’s ace; there’s a good chance of seeing him twice in a series. Both the Yankees and the Twins will open the series with a lefty ace on the mound. Three years since his breakout 2006 season, Francisco Liriano returned to form in 2010. His 2.66 FIP finished second in the AL to Cliff Lee, and his 3.06 xFIP led the way. What hurt him was poor results on balls in play. His .340 BABIP was the second highest among AL starters this season. Much of this is due to terrible outfield defense. Liriano’s BABIP on fly balls is .254, quite a deal higher than the AL average of .138. Unsurprisingly, the Twins rank 20th in outfield UZR. But even Liriano’s results on ground balls doesn’t compare favorably to the league. Of the 284 ground balls he has induced this year, 71 have gone for hits, a .250 BABIP. The league average is .231. Liriano punishes hitters with his slider. It’s tough to get a good gauge using pitch type values, since it doesn’t account for sequencing and we have no splits. 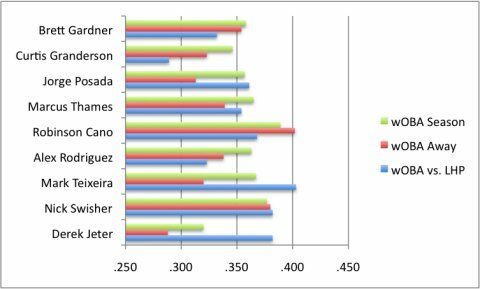 Liriano’s slider does rate as the best in the league, though that’s in large part because he throws it a third of the time. On a rate basis he falls below a number of other pitchers. 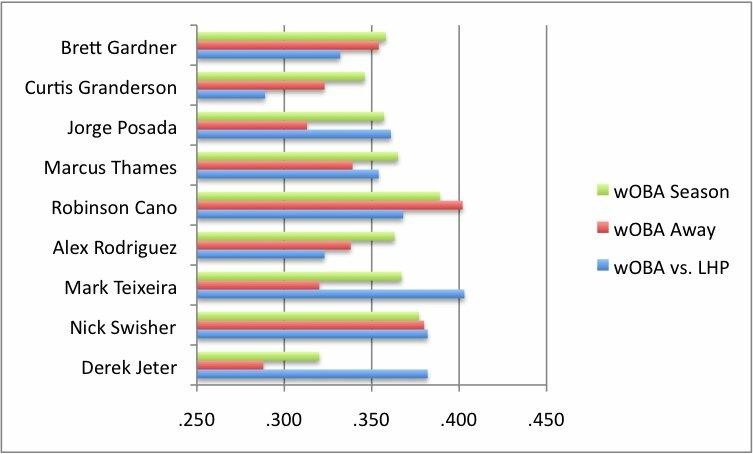 A few Yankees do hit the slider particularly well, including Robinson Cano, Marcus Thames, and Mark Teixeira. Still, without splits we can’t really gauge this with any degree of accuracy. Tonight’s Yankee lineup will feature three lefties — Cano, Curtis Granderson, and Brett Gardner. Unfortunately for them, Liriano does his best work against same-handed hitters. This season he has struck out 52 of 172 lefties faced (30.2 percent) while walking just four. Not a single left-handed batter has hit a home run off of him. The rest of the lineup will hit from the right side. While Liriano is a bit weaker against righties he still has excellent numbers, including a strikeout per inning. Righties do tend to hit the ball in the air more often, though, which as we saw can become a problem. If there is any concern about Liriano right now, it’s that he’s tiring down the stretch. After allowing just three home runs through the first five months Liriano allowed six in September. His strikeout rate dipped, though it still remained high at 8.1 per nine. That could be just the opening that the Yankees are looking for. What CC Sabathia has lost in strikeout numbers — and it’s not much — he has gained in ground ball tendency. For the first time in his career half the balls put in play off him were on the ground. The closest he came previously was in 2005. Yet he suffers from the same high BABIP on grounders as his counterpart Liriano. The league has hit .254 on ground balls in play off CC, while hitting .231 on ground balls overall. This can be in part attributed to the weak right side of the Yankees infield. Derek Jeter has a -4.8 UZR, while Alex Rodriguez is at -1.7. This might present problems for the Yankees, since the Twins rank near the top of the league in ground ball rate. 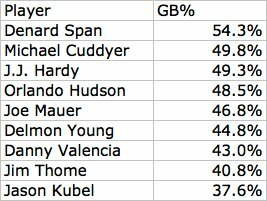 Denard Span, Michael Cuddyer, Orlando Hudson, and Joe Mauer are among the top 50 in ground ball rate. Sabathia for the most part features three pitches, though he’ll normally use only two on each hitter. Hitters of both handedness will see two types of fastball, a four-seamer that sits around 93, 94, and a two-seamer that sits around 93 and has sinking action. That’s what aids his ground ball rate. He’ll throw a fading changeup to righties, while he attacks lefties with a slider that, according to pitch type values, ranks near the top of the league. He’ll also use the slider against righties at times, mostly going for the low, inside corner. He has thrown just four changeups to lefties all season. In the Twins lineup he’ll likely face four lefties: Span, Mauer, Jason Kubel, and Jim Thome. None of them has particularly good numbers when facing same-handed pitchers. For his part, Sabathia handles lefties well, holding them to a .261/.318/.360 line. Of the 220 lefties he has faced this season he has struck out 62 (28 percent) while walking just 14. It’s not quite Liriano-style dominance, but he does combine it with excellent numbers against righties: .232/.295/.354 with an 18 percent strikeout rate. We hoped you liked reading ALDS Game 1 Preview: New York Yankees by Joe Pawlikowski! wOBA LHP and wOBA home/away is this season or career?